Christina Brunty is an associate in the business litigation practice group in Dykema’s Chicago office. Ms. Brunty’s practice focuses on a variety of complex civil matters, including products and premises liability defense, consumer financial services litigation, antitrust litigation, trade secrets litigation, personal injury defense, and data and privacy litigation. 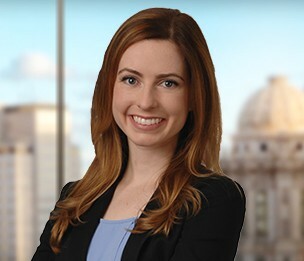 Ms. Brunty also assists a variety of commercial clients with antibribery, antiboycott, and privacy compliance, including during investigations and enforcement actions. Prior to joining Dykema, in her summer after her first year of law school, Ms. Brunty worked as a research assistant for Professor Avishalom Tor, conducting research in the area of behavioral law and economics. In law school, Ms. Brunty served as Editor-in-Chief for Volume 42 of the Journal of College and University Law. She also completed an externship with the National Immigrant Justice Center in which she argued in front of the Chicago Immigration Court and helped secure asylum for her clients. "Balancing Fourth Amendment Expectations in the Electronic Era"
Supreme Court to Decide Important Privacy Issue: Is Overseas Data Retrievable Under SCA? Stored Emails and Cell Phone Records: Are They Private?